Rick Steves gets me in trouble every time. When I get back from some excruciatingly long trip trying to keep everybody fed, happy, and rested as we hop from airplane to airplane, I swear that I am done with it for a while. As I suffer from jet lag and credit card debt, the only thing that excites me is the first night Bear sleeps all the way through the night again. We catch up on mail and bills, water the plants and the garden, and start to settle back into our home routine. It then starts so innocently. I re-read the Rick Steves guidebook on wherever we just went; just to reminisce a bit. Then I start reading his Postcards From Europe, enjoying the stories of his own travels. Then I start watching his shows on PBS and Hulu, and it is all over from there. 80 shows of some of the greatest places in Europe and the near East, and I always see something I have to go visit, and I start planning our next trip somehow forgetting about the long hours on an airplane. It was a slow afternoon at work the other day, and we were watching the PBS pledge drive as we waited for passengers to check in for our last flight. We put up with the half-hour sales pitch because they were having a Rick Steve’s marathon. As we chatted, waited for passengers, and watched enchanting scenes from the Dalmatian coast, I was only half paying attention. Until I saw people walking on board walks through watery grottoes over azure lagoons. And there was a river boat that looked like it was from some Amazon exploration from the 1920s. I was looking at Croatia’s Plitvice Lakes National Park. It looks like a place that exists only in stories about dragons, wizards, and distressed damsels. Somewhere that you would be as likely to find a water sprite playing tricks on a faerie as you would a gaggle of Japanese tourists, eyes glued to their view finders. Speaking of tourists, there seems to be a distinct lack of them in Croatia. I have only been to Europe in the off season, and mainly to places with few American tourists at any time of year, but from pictures and stories, I dread the overheated and overcrowded masses of August in Europe. But the Baltics have yet to be overwhelmed with British bachelor parties, plump German sunbathers, or American couples constantly telling everyone how much better things are done at home. I hope to visit soon, at least before Rick Steves gets me hooked on some other place. 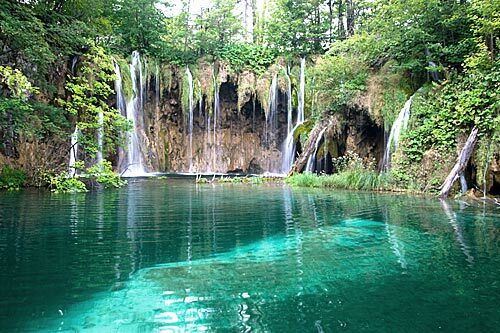 Note: If you have any must-see places, have been to Plitvice Lakes, or have flown in first class, please let me know! I’d love to hear your stories. This is my next dream vacation. I *loved* Slovenia, largely due to the distinct lack of American tourists (plenty of Austrian and Italian tourists, but they seem more subtle somehow). And the caves…. I will never forget those caves. But I too am enchanted by Rick Steves description of the Plitvice Lakes. My plan to convince Adam to agree to this destination is to offer to include a sailing trip. Croatia is supposed to be a beautiful place to sail. But next time you all go visit mom, if you can’t make it to Croatia, at least visit Slovenia. Bled is a (relatively) short train ride away, and it is an easy weekend trip. Rick Steves has some excellent advice regarding what to see in Slovenia as well.